Listening to Guy Klucevsek’s music Thursday evening was akin to watching...a landscape changing with the seasons or a city block evolving over a century. Generally, he begins with something simple then plays it again and again and transforms it each time over the course of maybe four to eight minutes. His ingenious, endless invention with ostinato, shadings of density and harmonic tension, counter-melody, virtuosic ornamental lines that spin brilliantly about the melody, divisional playing and, especially, sly displacement of rhythm and meters make his music constantly engaging. It’s always the same, and always different. The slip-sliding metric relationships of the various lines in the mix are as sophisticated as the layered rhythms of West African drumming. Klucevsek played 20 or so numbers, all by memory, on his accordion on this program, presented by Theatre Gigante. Some of them, written for dance or theater companies, originally involved other instruments, but they suit the accordion exceptionally well. His pieces do not click along at the same level. As they become more complex, they tend to become more intense and loud, which means he must drive more air through the reeds. Thursday, in the close quarters of the upstairs room at Paddy’s Pub, you could see and feel the accordion growing to meet the demands of the music, and this enhanced the sense that the music was getting not only louder but bigger. Klucevsek, who grew up in the Slovenian community within Pittsburgh, writes in a tonal idiom that often refers to the East European traditions associated with the instrument. He’s not shy about calling a polka a polka, but you’ve never heard one quite like his “Meet Me on the Midway Polka,” with its antic variations and virtuoso demands. Accordion Misdemeanors, a suite of pieces he composed for the audio book of Annie Proulx’s Accordion Crimes, comprises affectionate, identifiable yet highly original tropes on Cajun, Polish, Irish, Mexican, Italian and Boogie-Woogie accordion traditions. His homages to Piazzolla are very much in Piazzolla style, with dark, moody introductions gathering force toward a burst of tango energy that fades into ennui. In the Ligeti tribute, he pitted the most amazing polyrhythms and exotic harmonies against a...relentlessly repeated V- I cadence in the bass. It became like a drone, the foil for dissonance. But about those dissonances: They recur so frequently that the “wrong” notes start to sound very right–a very interesting acoustical and perceptual phenomenon. I’ve dwelt on the smart compositional devices that Klucevsek favors, and they are fascinating. But I can’t tell you about this music without saying that almost all of it is fun and funny. Witty turns of musical phrase, pull-the-rug modulations, crazy dance rhythms, surprise endings and all manner of sly musical jokes had the audience — which by the way was packed into the small room — laughing out loud. At such moments, the usually deadpan accordionist would allow himself just a hint of a smile. If you can get one of the hot tickets for the repeat performance at 7:30 Friday, you’ll smile too. June 20-21, Paddy’s Pub, 2339 N. Murray Ave. $25. Reserve Tickets: 414 961-6119. Visit Theatre Gigante’s website for more information. Forget everything you thought you knew about the accordion. Klucevsek is a trailblazing virtuoso. A rebel with an accordion...Klucevsek combines poker-faced wit and imagination with command of his instrument, forcing you to re-think the accordion’s limitations. Klucevsek is a musical Orient Express whose themes pass from Hungarian gypsy to Slovenian waltz to Middle Eastern wail without stopping at the borders. A remarkable performer on a remarkable instrument... Klucevsek writes the world’s most abnormal “normal” music...wheezing like the Godzilla of accordions. No other composer on the scene is so untouched by fashion. If you ever get a crack at hearing him live, sell whatever it takes to raise the funds to get there! Startling sounds by a master of experimental accordion music. His criminal infractions on The Blue Danube deserve to replace the original. The music expressed was complex, sly, virtuosic, and deeply felt and imaginative. 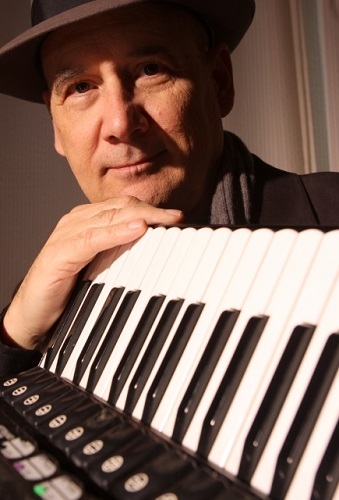 Guy Klucevsek is an accordion player that will not let the noble squeezebox go gently into that good night of polka, zydeco, and Tex-Mex sounds (not that there’s anything wrong with them). Klucevsek plays notated compositions (his own and others’) written for the accordion as a “modern” instrument, not a quaint, folk-y, and/or oldtimey thingamabob. The fractured, jazz-accented waltz “Pink Elephant” recalls the daffy cool of Frank Zappa’s classical-type compositions and Warner Brothers’ cartoon music. The elegant, heart-swelling Frenchness of GK’s “Hymnopedie” series would’ve been perfect for/in Woody Allen’s Midnight in Paris. The swirling “Breathless and Bewildered” shows the (un)common ground between the oom-pah of polka and the stirring strains of Balkan folk. If you’ve a narrow (or no) appreciation for the accordion, the aptly-named The Multiple Personality Reunion Tour will fix that.